The annual Bath Junior Table Tennis championships were held on Saturday 25th February and produced some very fast and competitive games, demonstrating the strength and depth of junior table tennis in Bath. In both the under 15 and under 18 competitions there was an abundance of talent on display with great potential for further development. In all there were 15 entrants from Bathampton, Batheaston, Bathford, Oldfield and St Mark's table tennis clubs. The first U15 semi-final was between two Bath League players: Leon Kashdan-Brown from the Premier Division and Will Avery from the Second. Leon's experience and penetrating attack won through against a spirited effort by Will in three straight games: 11-7, 11-7, and 11-8. The other semi-final pitted Olly Newton against Cal Levitt. Olly is coached by his grandfather, along with his brother and sister who also played in the tournament. In a similar score to the other semi- final, Cal's superior attack held off determined defence from Olly: 11-8, 11-7 and 11-8. In the final, it was literally a head to head with both Leon and Cal trading fast counter-attacks. Leon's superior angled forehand attack won in four games: 11-5, 14-12, 8-11, 11-5. The U18 event was contested by six of the under 15 contestants. This time Olly played Leon in the semi-final. The first game was hard fought with Leon eventually winning. Despite Olly's all-round play, Leon's ability to attack hard on forehand and backhand won the match: 12-10, 11-6, 11-8. 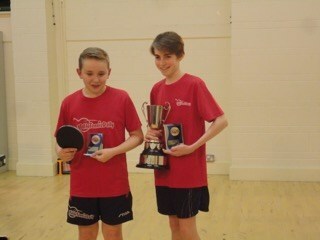 Tommy Franklin-Evans, a relative newcomer to the Bath table tennis scene, played Cal in the other semi-final. Overcoming a one-sided defeat in the first game, Tommy won the second with great defensive skill. With sharper focus, Cal resumed his successful attacking play winning 11-3, 8-11, 11-8, 11-6. The U18 final between Leon and Cal was arguably the best match of the evening. Despite forcing Leon to defend far back from the table on occasions, Cal could not turn this advantage into points. Leon won his second trophy of the evening 11-7, 11-5, 11-4. The winner and runner-up trophies were presented by Mike Newton, Secretary of the Bath and District Table Tennis League. Junior table tennis is provided at Bathampton Scout HQ on Saturday nights 6pm to 8pm (contact Ray Bennett 01225 866880 or ray@classicsights.co.uk), and St Mark's School, Larkhall on Thursday nights 7.15pm to 9.15pm (contact Mike Clare 01225 317111).